Berger had the stone analysed by the Gemological Institute of America, which confirmed its authenticity. He published a blog in Entomology Today about his finding and is looking for entomologists to further analyse it. Plants produce a sticky substance called resin mostly as a means to protect themselves. Under the right circumstances, the chemical structures of these resins can change over time, fossilising into amber – occasionally trapping and preserving an insect inside. 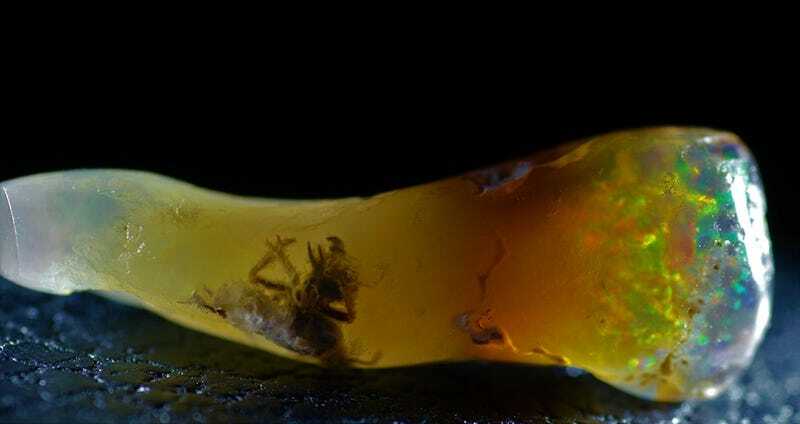 This specimen probably started as a typical insect trapped in amber – but then it appears to have gone through a second process called opalisation, where some of the amber turned into opal. Opals are essentially spheres of silicon dioxide with water combined into their chemistry. Organic specimens can turn into opal similar to the way fossilisation turns bone into stone; palaeontologists in Australia have recently found an opalised dinosaur fossil.